Budweiser attracted a lot of attention with its Super Bowl ad claiming its beer was “brewed with wind power,” but what does that actually mean? Furthermore, is Budweiser being completely straightforward when it says it gets 100 percent of its electricity needs from wind energy? The 60-second ad opens with the wind blowing in a Dalmatian’s face, then pans out to show the iconic Budweiser Clydesdale-pulled wagon through windswept fields. In the background are massive wind turbines as Bob Dylan’s “Blowin’ in the Wind” plays. A visit to Budweiser’s website reveals the company gets 11 percent of its energy needs from renewable sources, including wind turbines, solar panels, biogas and landfill gas. The company is part of a coalition of major companies pledging to get all their energy from renewables. With regards to wind power, Budweiser says its beer “will be brewed with 100% renewable electricity by 2025” at facilities around the world. Budweiser said the opening of an Oklahoma wind farm is “powering 100% of Budweiser’s total purchased electricity for brewing in the US starting in 2018,” reads their energy website. Now, the energy website says about “one third of our brewing comes from electricity, while the rest comes from heat.” So, in terms of total energy footprint, wind theoretically powers one-third of U.S. brewing operations. And that’s another wrinkle. Budweiser’s claim they’re “powered with wind” is theoretical. The company’s electricity needs are not solely met with wind power or else they’d be forced to shut down when the wind doesn’t blow. 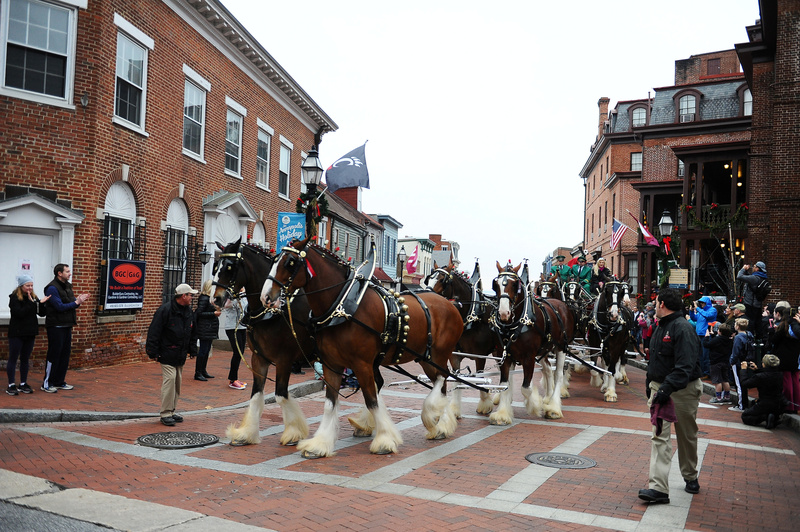 The Budweiser Clydesdales lead the Military Bowl parade marched Main Street in Annapolis in Maryland, U.S., December 31, 2018. REUTERS/Mary F. Calvert. What Budweiser does is pay the Thunder Ranch to produce wind power for the grid for which they receive renewable energy credits. Those credits are an accounting measure that shows the company purchased wind power, not that they used it. Based on where Budwesier operations are located and U.S. electricity data, it’s basically impossible for the company to meet its actual needs with just wind power. Not only is wind power intermittent — it only works when wind blows — it only makes up 6 percent of U.S. electricity generation, according to federal figures. Thunder Ranch electrons are mixed in with those from natural gas, coal, nuclear power and other sources before going to their destination. Even Budweiser’s website says it has a “virtual” purchase power agreement with Thunder Ranch. In other words, Budweiser pays for wind power, but doesn’t necessarily receive it. In fact, Budweiser likely still relies on fossil fuels for the vast majority of the energy needs at its 12 U.S. breweries.